How to share files in Chatter across communities? 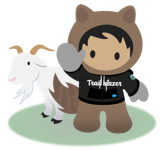 The Getting Started with Communities doc and the very helpful "Rules of the Road" deck both seem to imply the same reality: To share files across communities, such between the default internal community and an external community, users have to use Salesforce CRM Content. However, while I'm able to attach a file stored in a content library to my Chatter posts in the internal community, the same file does not appear to be available for sharing when I switch to the external community. My question is: How can I attach the same file (i.e., a link to the same file, the "one version of the truth") to my Chatter posts in both the internal community and an external community? To clarify the situation, below are screenshots showing a file's sharing settings and appearance in the "Select a File to Attach" popup, in the internal community. Below are screenshots showing the same file's sharing settings and appearance in the "Select a File to Attach" popup, in an external community. What I'm seeing is that the same file appears available for attachment in the internal community but not in the external community. Been trying to recreate this in my dev org and can't seem to make it happen the same way. Can I ask, did you add any Members to the Community Library? I made a Public Group of "All Partner Users" and I was able to access the library while Posting a Chatter file. Hello, Brian, thanks for the reply. Can you confirm that you are accessing the library from a different community than the one in which the library was created? By default the person who created the library is automatically added to the library as a Workspace Administrator. The screenshots I included in my original question were all taken while logged in as a System Administrator and the same user who created the library and contributed the content. So in theory library permissions should not have been an issue. With that said, I've tried creating a public group as you did and adding that to the library, but the result is the same. Please take a look at the screenshot below showing the library with my custom public group, and the screenshot showing that I am included as a members in the group. Ah you are right Marty, I missed that piece. My result was from a User to a Community. I'll give it another try and see what I find. Wish I had better news Marty...I can now confirm that the Content that was created in a Library in Community A is not available in Chatter for a different user logged into Community B - just as you have found. It seems that the Content is only available to post in a Chatter message in the Community that it was initially added in. However, when I go to the Library, the Content is visible to me to deliver, etc..
Maybe a bug or a setting we're missing? I found the following article (http://carvingintheclouds.blogspot.com/2014/10/share-chatter-files-across-communities.html) a helpful explanation of this limitation, and voted for this idea (https://success.salesforce.com/ideaView?id=08730000000l8PAAAY) to make things more intuitive.